The Versailles-like City of Bordeaux is located in the Aquitaine region of Southwest France and near the spectacular white sandy beaches of the Côte d’Argent on the Atlantic Ocean. Half an hour inland, the sweeping Garonne River divides the city into the left and right banks. 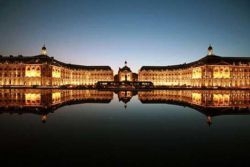 The panoramic view of Bordeaux from the river is breathtaking and elegant. Enjoying the climate of Northern California, this UNESCO World Heritage Site with over 350 classified historic buildings is also part of the Routes of Santiago de Compostela and centre to the world’s most spectacular wines and food. Are you thinking Paris without the stress yet? But here's the best news - although the French view this jewel as one of the top three places to visit, Bordeaux is largely undiscovered by the rest of us. With a population of 250,000 plus and over one million in the metropolitan area, Bordeaux is the capital of the Aquitaine region and the prefecture of the Gironde department. The international airport, Bordeaux-Merignac, is 30 minutes from the city centre and brings in travelers from around the world to a climate that enjoys almost 2000 hours of sunshine, the same as the French Riviera, and temperatures averaging 26.5 degrees in July and August. Bordeaux is surrounded by the world’s most famous wine areas such as the Médoc, Graves, Côte de Bordeaux, Saint-Emilion, Entre-de-Mers and names like Château LaFite, Château Latour and Rothschild melodiously ring in your ear. Known as the centre of gastronomy, the city of Bordeaux boasts seven Michelin starred restaurants along with six more in surrounding areas. There is an extensive choice of hotels in Bordeaux suited to every taste and budget. You’ll also find fabulous shopping, galleries, spas, sporting attractions and 20 golf courses within an hour of the city. Bordeaux, also know as Port de La Lune, is the second port of call for cruise ships along the Atlantic Ocean and whether you choose to come in by a cruise or with your own boat you will be greeted by the most breathtaking cityscapes on your itinerary. Bordeaux still remains one of the best kept secret getaways of the French people and those in the know! Bordeaux has over 350 classified heritage buildings including three listed religious World Heritage Buildings which are part of the Routes of Santiago de Compostela in France. 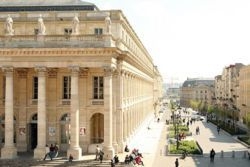 Alain Juppé, the exceptional mayor of Bordeaux, spear-headed the stunning urban renewal project in 1995 which brought Bordeaux into the world spotlight and on to the UNESCO World Heritage page in 2007. It is now the largest urban site of UNESCO World Heritage. Alain Juppé and team proved that "the one word, Bordeaux, conjures up at the same time, the city, the vineyards, the wine, and all are inextricably linked over the centuries." Through a rich heritage going back to Neanderthal man, the Celts, the Romans, the English, the Dutch and the French, Bordeaux has developed into one of the most sophisticated and vibrant cities in Europe. It is the true capital of the beautiful Aquitaine region and as many a Bordelais will tell you, to live in Bordeaux is to be "Living the Good Life". It is a great jumping off point to the Côte d’Argent with its famous beaches and elegant seaside towns such as Arcachon and La Rochelle. Bordeaux is also within easy driving distance for countless day trips. For example, go inland to the wine regions and sample the best spirits of "Cognac" and "Armangnac" or even more vineyards in the Cahors and Bergerac areas. Not to be missed of course are the famous Caves of Lascaux cited as the world’s capital of prehistory.